You no longer need to go to your favorite brewpub to enjoy a nitrogenated beverage. Mesmerizing. That’s what it’s like to watch the cascading bubbles in a glass of freshly poured beer carbonated with nitrogen in addition to the far more common carbon dioxide. As the bubbles slide down the interior of the glass and the thick, creamy head rises to the top, the foam concentrates the brew’s aroma so you can taste it even before you bring the glass to your lips. And when you tilt the glass back, the velvety mouthfeel of nitrogenated beer allows all its flavors to linger on your taste buds. Only a few large breweries (Ireland’s Guinness, most famously, since they pioneered the concept) and even fewer microbreweries (Left Hand and Oskar Blues, both in Colorado coincidentally, come to mind) sell nitrogenated beer in retail containers. But the vast majority of beers, whether served from a tap at your favorite watering hole or poured from a bottle or can at home, are carbonated using carbon dioxide. 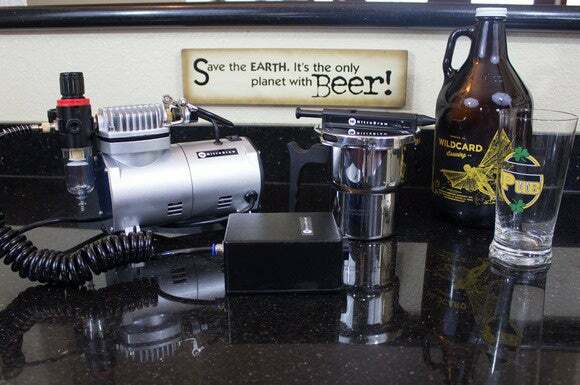 Set a NitroBrew on your counter, and you can add the benefits of nitrogen to any beer you like. The company says its device can deliver equally good results with iced coffees and other drinks, too, but I sampled only beers. A great number of them. All in the name of research, of course. More on that in a bit. The beer poured from the kettle only looks like it's all foam. It will settle soon enough. 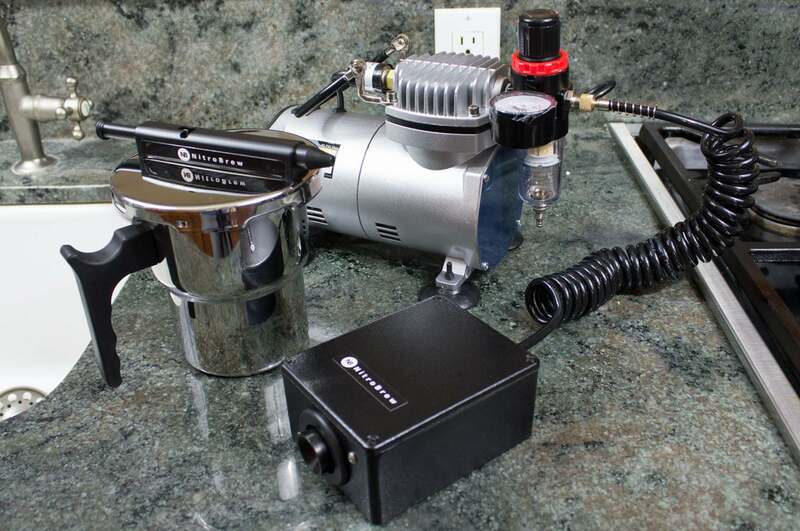 The NitroBrew kit consists of three components: A countertop air compressor, a stainless steel kettle, and a nitrogen charging station. 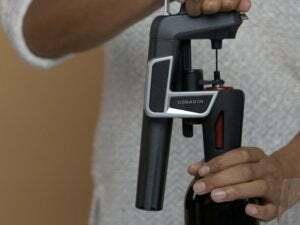 Pour the beer you wish to nitrogenate into the kettle, close its twist-lock lid, push the nozzle into the charging station, and then press the kettle's plunger button down about halfway. The charging station scavenges nitrogen from the air as the compressor injects it into the kettle. The kettle’s ingeniously designed lid automatically locks as the air pressure inside increases, forming a leak-proof seal. Once the compressor shuts off (NitroBrew recommends setting it to 35psi), give the kettle a good shake to distribute the nitrogen gas throughout the beer. Turn it upside down over a glass and push the plunger all the way in to dispense the beer. For my first home-nitro experience, I purchased a growler of Wildcard’s third-anniversary brew: Their excellent Double Down imperial red ale aged in pinot noir barrels. I’ve had mixed experiences with beers aged in wine barrels—the essence of the wine can overwhelm the flavor of the beer—but the Redding, Calif.-based Wildcard pulled it off perfectly. I thought I had nothing but a glass of foam the first time I poured beer from the NitroBrew kettle, but this settled into a high, creamy, and persistent head within 30- to 45 seconds. The beer tasted great straight from the growler, but injecting nitrogen into it intensified its flavor and reduced its acidity. Over the course of the next couple of weeks, I nitrogenated a number of other beers, including Bear Republic’s Racer 5 (an India Pale Ale from a bottle) and three darker brews—varieties more typically associated with nitrogen carbonization: Sierra Nevada’s Chocolate Chili Stout (from a growler), a Wildcard Brewing Reason for the Season (a bottled coffee cream stout), and an Oakshire Brewing Espresso Stout (from a can). After A/B taste tests with each brew, I found that I enjoyed the taste and the mouthfeel of the nitrogenated version more than I did the version carbonated solely with carbon dioxide. The black cube connected to the air compressor scavenges nitrogen from the air and injects it into the kettle. Introducing nitrogen to beer has three primary effects: It transforms the presentation of the beer in the glass, it changes the way the liquid feels in your mouth and on your tongue, and it amplifies the flavor. I’ve already described the first effect. The change in mouthfeel comes about because nitrogen is less water soluble than carbon-dioxide. Nitrogen gas diffuses from the liquid and forms bubbles that float to the top of the glass as foam, more commonly known as head. Since nitrogen bubbles are much smaller than carbon-dioxide bubbles, the foam persists longer and the beer beneath it feels thicker and less bubbly. The change in flavor stems from the carbon dioxide dissolving into the beer. As it does this, a chemical reaction forms carbonic acid. Injecting nitrogen into the beer displaces some of that CO2, which in turn reduces the beer’s acidity. That’s one reason why most nitrogenated beers have tended to be malt-heavy stouts instead of the more hop-forward varieties, because the nitrogen can fade and flatten the flavor and texture of the hops. Nitrogenating an IPA like Racer 5 makes it less crisp, but reducing the fizz also enhances the beer’s flavor and gives it a longer aftertaste. NitroBrew also sells flavors and essences that you can infuse into your favorite beers (cedar, orange, fennel, ginger, and more), but I didn't try these. The NitroBrew can make any beer taste better and smoother. I tried it with IPAs, red ales, porters, and of course stouts. While more breweries are shipping limited varieties of their beers in cans and bottles with widgets that release nitrogen into the beer when the container is opened, they typically limit these offerings to stouts and other malt-heavy beers. The same goes for brewery taprooms—and most of those won’t put what nitrogenated beers they do have in a growler because the beer’s shelf life is too brief. 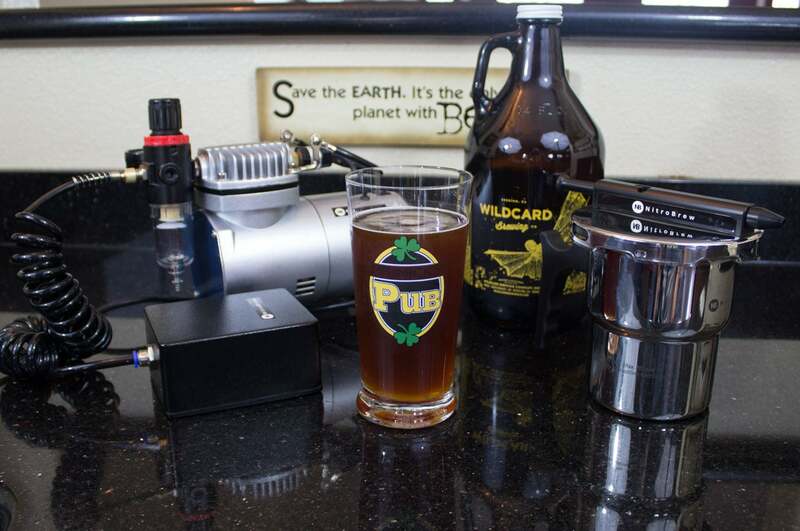 With the NitroBrew, you can add nitrogen to any beer you want, one serving at a time. I can’t imagine myself drinking nitrogenated beers exclusively, but the minor additional prep time—and the clean-up that followed—weren’t factors that would discourage me from using a NitroBrew frequently. The taste is worth the effort. The setup isn’t cheap, though. The full kit reviewed here sells for $355 plus shipping ($298 plus shipping if you provide your own air compressor). But nitrogen isn’t a gimmick or a passing fad, so you’ll be able to amortize the cost of the hardware over a very long period of time. 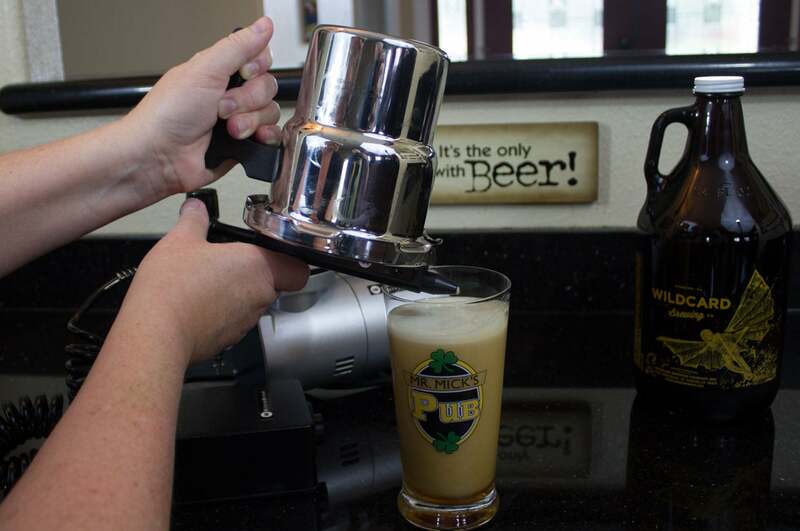 The NitroBrew adds something special to any beer you like to drink. It's very easy to use and cleanup is quick and easy.